^ Blake, Robert (1977). A History of Rhodesia (First ed.). London: Eyre Methuen. p. 114. ISBN 9780413283504. 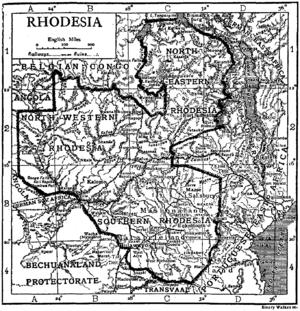 ^ The Northern Rhodesia Journal online at NZRAM.org: J A Gray: "A Country in Search of a Name", Vol III, No. 1 (1956) pp75-78. See also the note on p82 about the Rhodesia Boma being located at Kalungwishi not Chiengi. "Public Holidays". Rhodesia Calls. Salisbury: Rhodesia National Tourist Board: 48, 91. November – December 1972. This page was last edited on 30 January 2018, at 22:41 (UTC).